Precision Racks Manufacturing Company (PRMC) was started in the year 1972 as an ancillary unit to the telecommunication's major Indian Telephone Industries Limited. Over the years PRMC has established itself as a manufacturer and exporter of high quality electronic modular enclosures. 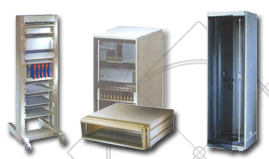 Today, PRMC's product range includes 19" Floor Standing Racks, Wall Mounting Racks, Sub - racks, Instrument Cases and a wide variety of accessories catering to various industry verticals such as Aerospace, Defense, Computers, Electronics & Telecommunications. Building on long-term strategies and continually orienting ourselves towards customer needs has helped us keep ahead of the competition. A 360° approach in understand-ing your business and delivering the right solution in the most systematic way has been our strength. Racks that incorporate all the best current international practices for Data Communication Networks, Industrial Electronics, Instrumentation and Telecommunication needs. Racks that are specially designed for client requirement in other applications. PRMC offers a wide variety of accessories that compliment its entire range of products.